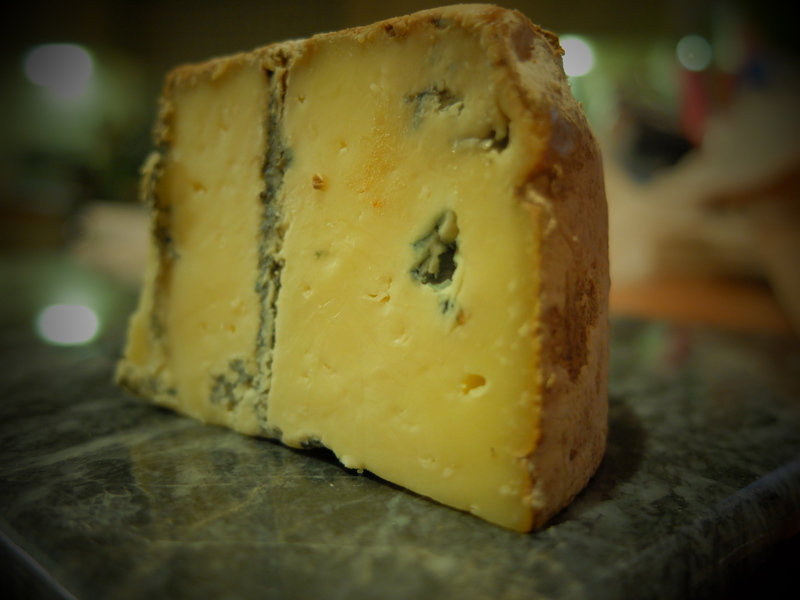 Cornish Blue is a blue, pasteurised, cow’s milk cheese produced by Philip Stansfield on his farm on Bodmin Moor. The Stansfields starting making cheese in 2001 and, like so many other dairy farmers at the time, it was a way to try and make some money out of their milk in a climate of plummeting prices. Through researching the market, they realised there was no blue cheese being made in Cornwall and that most British blue cheeses were pretty pungent, whereas softer, milder blues tended to be imported from Europe. They also thought that women might like such a cheese, presumably because it’s mild (although they’re on dodgier ground here with me; they’ve obviously never witnessed the very ladylike action of someone trying to lick the salt out of a Roquefort’s veins). They’d thought of a cheese, they’d thought of a name (simple, appropriate and redolent of the lovely tableware which itself makes me think of dairies and thick yellow pouring cream). But Philip knew nothing about cheese-making. He went on a course and describes the first time he had to make cheese solo as ‘probably the most terrifying day of my life’. A year of research and development followed, during which they threw away thousands of pound’s worth of cheese and had to contend with the 2001 foot-and-mouth disease crisis, which brought much of British agriculture to a standstill. Fastforward more than a decade and my, how things have changed. They’ve gone from making 30 kilos of cheese at a time to producing three tonnes at their busiest times. And the reason why it was gracing the cheese counter of my local supermarket? Well, I’m guessing that has something to do with the fact that in 2010 Cornish Blue was crowned World Cheese Award Champion; yes, that’s right, it was voted best cheese in the world, beating more than 2,600 entries from 26 different countries. The milk comes from their own herd of Friesian Holsteins, 240 of the black and white beasts. The cheese is made by hand with vegetarian rennet and starter cultures including Penicillium roqueforti. The curd is cut and then separated from the whey on a draining table before being packed into moulds. The following day they are dry-salted before retiring to a maturing room where every now and then they are pierced to encourage the blueing before being matured for 10-12 weeks. Apart from being an artisan cheese that filled a gap in the market, the climate or in winey terms le terroir, contributes a great deal to the cheese. Their corner of Cornwall is blessed with high rainfall and a mild climate which creates perfect cheese-maturing humid conditions. It’s a mild cheese, akin to a Cambozola or Gorgonzola rather than a spicy Stilton or eye-watering Roquefort. It always sounds patronizing to all concerned to describe a cheese as an ‘entry-level blue’ but it’s certainly one for people who twitch at the notion of a blue cheese. It’s not a boring cheese though (which in my humble opinion Gorgonzola Dolce can be); it’s creamy and sweet with long bore-like streaks of blue (as you can see in the photo) rather than a motorway-network of veins. Mine had a really dirty blue-brown hole near the rind which was especially nice (although I suspect the huffy deli-woman gave it to me on purpose because she thought it looked nasty). Definitely one to throw in the basket on your next supermarket shop. With additional research from Paxton and Whitfield and the BBC. Yum, I love the sound of that. I’m partial to a strong blue too but sometimes you want a dollop of something creamier to slather on your bread. Thanks for the introduction to a new cheese – though I can’t say the same for the extremely disturbing image of you doing a Twilight routine on an unsuspecting Roquefort. That will stay with me for a long time to come. It was rather tasty, and we did purchase a wedge. Every Friday you inspire me to make a trip to the cheesemonger! Thanks! You have reminded me that I rather like Cornish Blue, and that’s its been a while since we were acquainted.. I have never thought to seek out in the supermarket cheese counter will have a better look though the glass next time! I like its mild but blue too and creamy. Mmm! It is a nice one and, yes, I think it can be found in lots of supermarket cheese counters thanks to its world champ status. I am drooling. A proper drool. Mmm, Garlic Yarg, lovely. Chatel is a new one on me though, sounds nice.